Make this easy 3 ingredient DIY slime recipe today for a perfect class gift with very little effort and lots of WOW factor! 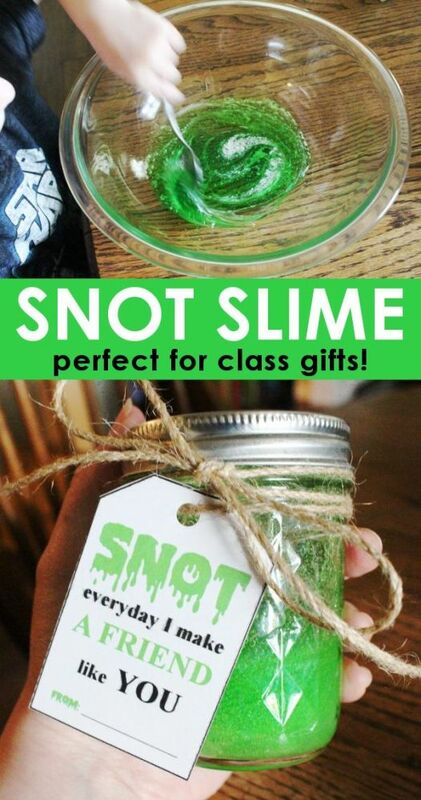 This DIY slime recipe make the perfect class gift for Christmas, Valentine’s day, or just because! 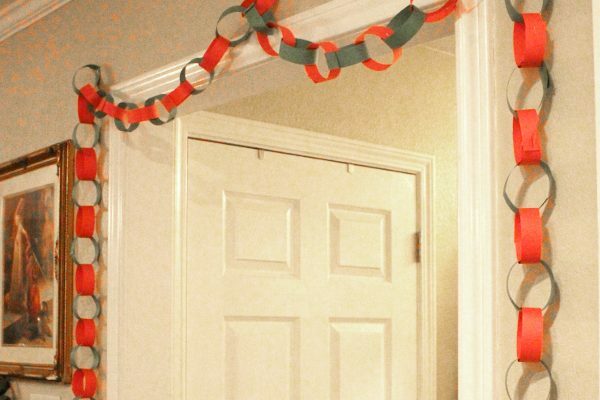 And I know a lot of little boys who would love to receive this as a birthday party favor too! 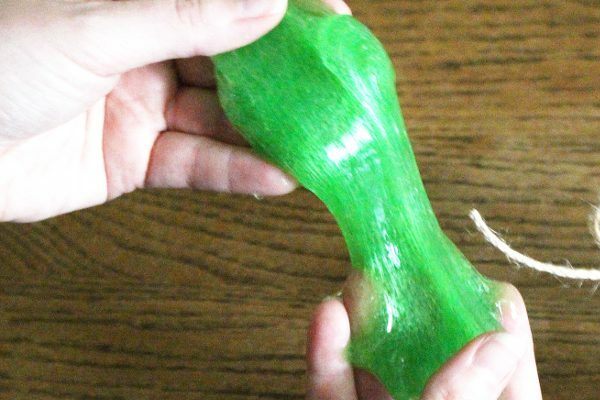 Whatever your reason for wanting to make this slime, it comes together quickly and is sure to be loved by everyone who is lucky enough to be gifted their own set! Be sure to grab the free printable gift tag at the bottom of this post! 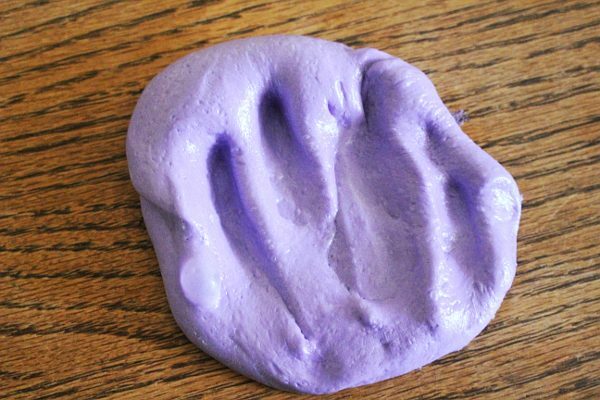 As a kindergarten teacher I made slime all the time with my kids in the classroom. 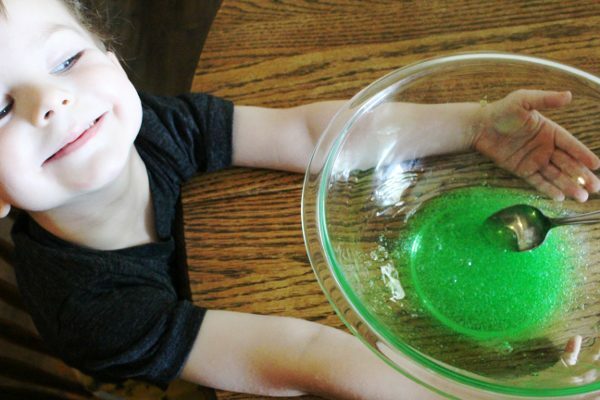 We made frozen slime, glitter slime, marshmallow slime, and more! 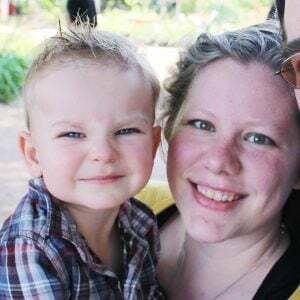 But as a busy toddler mom, it had somehow gotten away from me to make some slime with my own son! After a brief explanation he was even more onboard with the project and couldn’t wait to get started! I wanted to let him have as much hands on time learning how to make slime as he possibly could, so I skipped the borax variation and went right for the tried and true non-borax slime which is made with glue, baking soda, and contact solution. A note on contact solution: In order for this to work properly, you will need a contact solution that has both boric acid and sodium borate in the ingredients list. This is the brand we used. And at last we were ready to make our slime! 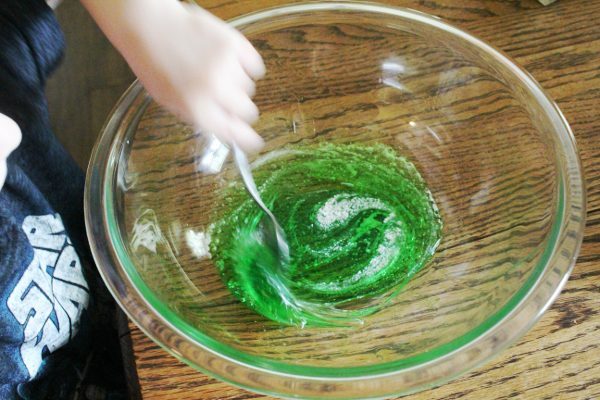 With the glue and food coloring in the bowl, I let my son start mixing. This went on for quite a while, because this kid loves anything that even remotely resembles cooking! Once he had mixed his fill there, we added the baking soda and he mixed some more! Then it was time to add the contact solution. I opted to do this part myself, since it can get a little tough to stir for a 3 year old. But as you can see, he was thrilled to be able to hold the bowl for me! Once it reached that perfect snotty consistency, we stopped mixing and started playing with our homemade slime! As soon as he reached his hand into the bowl, my son said “ewwww, it’s snot!” Ha! 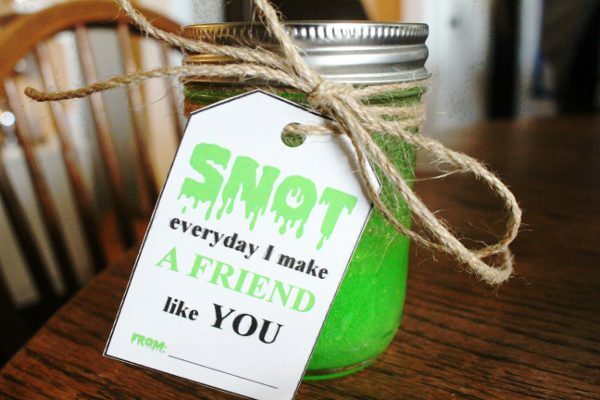 I was inspired by his comment to make a printable gift tag to go along with the slime and he already has plans to hand this stuff out at his next party – be it Christmas, birthday, or Valentine’s Day! 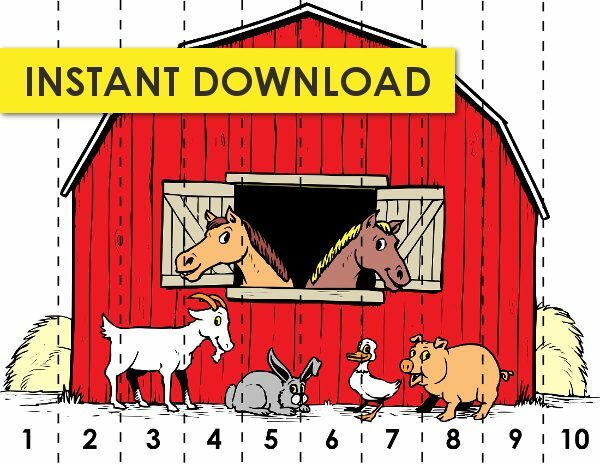 Grab the Member’s Only download at the bottom of this post! 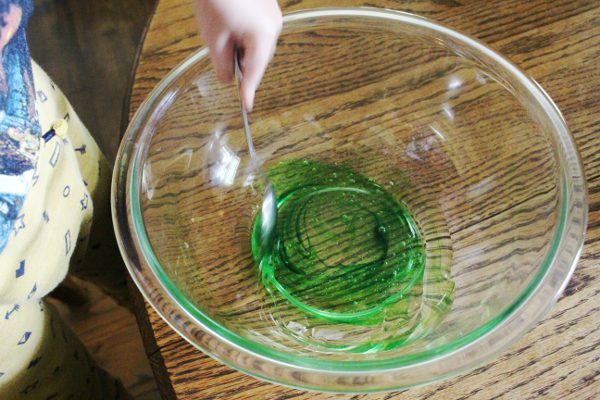 Mix glue and food coloring in a large bowl. Add contact solution and mix until slime thickens. You may need to add more contact solution and knead with your hands if you want it to be thicker. Do this 10 drops at a time. 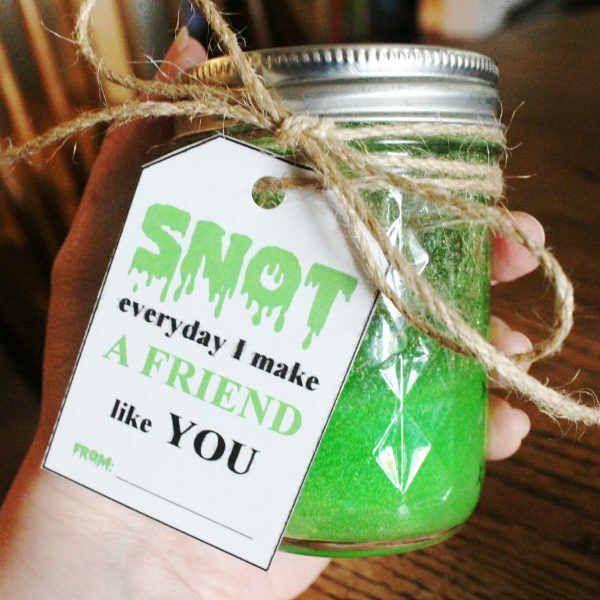 This adorable Snot Slime Gift Tag is part of our member’s only library! And it’s completely free to become a member! Whoo-hoo! 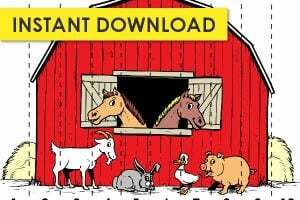 If you are an existing member, click here to head to the member’s only section and enter the password from your welcome email. Otherwise, sign up below to become a member and get the library password!